Luminous galaxies far brighter than our Sun constantly collide to create new stars, but Oxford University research has now shown that star formation across the Universe dropped dramatically in the last five billion years. The research, co-led at Oxford by Dr Dimitra Rigopoulou and Dr Georgios Magdis from the Department of Physics, showed that the rate of star formation in the Universe is around 100 times lower than it was five billion years ago. They also showed that some luminous galaxies could create stars on their own without colliding into other galaxies. The findings, published in the Astrophysical Journal, suggest that most of the stars in our universe were born in a 'baby boom' period five to ten billion years ago. 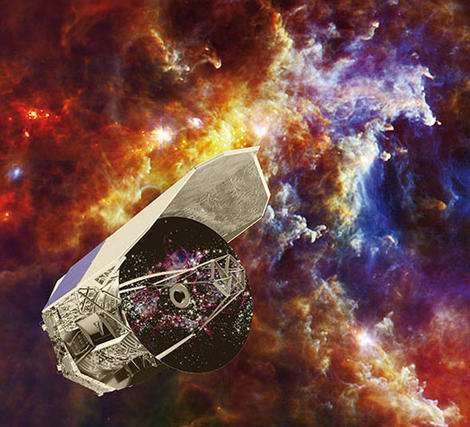 The observations were made using the European Space Agency's Herschel Space Observatory. I asked lead author Dr Rigopoulou to explain the research and what it tells us about the birth of stars. OxSciBlog: What has changed in the last five billion years? Dimitra Rigopoulou: There is clear evidence that the galactic-scale physical processes that initiate the formation of stars in the most luminous galaxies in the Universe have changed. Locally, luminous galaxies that produce a large volume of stars are almost always associated with galaxy interactions or merging. When galaxies collide, large amounts of gas are driven into small, compact regions in the galaxies causing stars to form. This process results in a highly efficient conversion of gaseous raw materials into stars. However, we found that many galaxies were able to form stars without colliding a few billion years ago. OSB: Why is this important? DR: We know that the majority of the stars in our Universe were born in massive, luminous galaxies. Our results change our understanding about how stars were formed in these systems. Consequently, our view about the way the majority of stars formed in our Universe must change. OSB: Why is it surprising that non-colliding disk galaxies can create stars? DR: Normal disk galaxies are unperturbed systems that undergo a slow and steady evolution. So, by discovering normal disks with very high star formation rates we have uncovered a fundamental change in the galactic-scale process of star formation in the most efficient star-forming galaxies of our Universe. OSB: What results surprised you the most and why? DR: Over the last decade there have been various lines of evidence suggesting that in the early Universe around ten billion years ago, luminous galaxies were quite different from what we observe in the present day. To our surprise, we found that this change already occurred less than five billion years ago, suggesting that the changes were very rapid and did not happen over long timescales. We measured ionised carbon, which is produced when the gas in the galaxy cools down and collapses initiating the formation of stars. The ionised carbon levels from luminous galaxies five billion years ago were very similar to those from ten billion years ago but completely different to today's galaxies. Something important must have happened to change galaxies' behaviour to what we see today. OSB: Do we know why galaxy behaviour is changing? DR: We think there are two main factors responsible for the change in the behaviour of galaxies: one is the amount of gas that is available to them and the other is the gas 'metallicity', the proportion of matter made up of chemical elements other than hydrogen and helium . As galaxies get older, they use up their gas to make stars so they run out of the raw material needed to create more stars. The availability of large gas reservoirs means that some galaxies can make stars efficiently without the need of interactions to trigger the star forming activity, as happens in local galaxies.Metallicity, on the other hand, is very closely related to star formation so a change in the specific make up of the gas can have a huge impact on the way star formation proceeds and hence affect a galaxy's behaviour. While our results have highlighted these important changes in the way galaxies form their stars as they turn older we now have to follow these leads and firmly establish these points of change in the fascinating lives of these luminous infrared galaxies. "Luminous galaxies far brighter than our Sun ..."
Oops, I think that should read "brighter than our Milky Way ..."
And the merger mania continues, despite the evidence. Still trying to cram that square peg... Isolated growth of a well-developed spiral is just more evidence for the inside-out growth model, dummies. And this big change they try to pin down to 5 billion years ago is likely just some unrecognized observational problem. Fleetfoot: Thanks for catching it. I saw it while I was going through but you beat me to the comment. Tuxford: For your own sake, stop sniffing the glue. "We know that the majority of the stars in our Universe were born in massive, luminous galaxies"
According to the accepting PS galaxy luminosity function, most of the numbers of; most of the luminosity of; most of the mass of; the population of galaxies residing in our universe, are the smallest dimmest faintest "dwarf Elliptical (dE)" galaxies. Extrapolating knowns, that trend implies even more numbers, mass, luminosity, in yet-smaller galactic systems, i.e. "dwarf Spheroidal (dSph)" galaxies. Of all the stars humans commonly consider, most reside in the biggest, brightest, most-human-eye-catching galaxies... but in between those big "galactic mega metropolises", most galaxies (and most mass & luminosity from stars) are far fainter, dimmer / darker dwarfishly smaller systems. "This is due to the steepness of the LF and the fact that the luminosity density at z ∼ 10 (as at z ∼ 6−8) is domi- nated by the faint, lower luminosity sources"
"This is due to the steepness of the LF and the fact that the luminosity density at z ď��Ä� 10 (as at z ď��Ä� 6−8) is domi- nated by the faint, lower luminosity sources"
The proportion of small galaxies was much higher when the universe was less than 950 million years old so what you say will be less true now.